The steel members are deformed during transportation, and there are dead bending or slow bending, which causes the failure of the components to be installed. 1) due to the deformation of the welding of the steel structure construction , the gentle bending is generally presented. 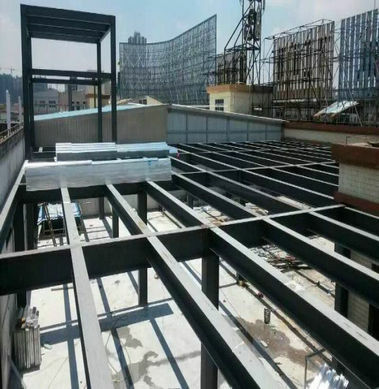 2) when the steel structure is to be shipped, the supporting point is not reasonable, such as the upper and lower padding wood is not vertical, or the site of the stacking is subsided, so that the member produces dead bending or slow deformation. 3) in the transportation of steel structure, the deformation caused by collision is usually caused by dead bending. 1) when the steel structure is made, the measures to reduce the welding deformation are adopted. 2) assembly welding, using anti deformation measures such as assembly order should obey the welding sequence, using the assembly tool, a bracket arranged enough, prevent deformation. 3)pay attention to the rational allocation of the padding points in the transportation and transportation. 1) the dead bending deformation of steel structure is generally treated by mechanical correction method. It is corrected by jacks or other tools or supplemented with oxyacetylene flame. 2) when the structure has a slow bending deformation, the oxygen acetylene flame is used to redress the structure. 3) the full length distortion of the steel beam member exceeds the allowable value, which causes the poor quality of the steel beam installation. 1) the stitching process is not reasonable. 2) the size of the assembly node does not meet the design requirements. 1) the assembly member should set up the assembly worktable, which is determined to make the bottom of the component flat to prevent warping. The assembly table should be at the level of each pivot, and the welding deformation should be prevented in the group welding. Especially in the last assembly segment or stairway, to adjust the positioning in the deformation after welding, the attention node should comply with the design size, otherwise easily lead to distortion component. 2) the component of its own rigidity is poor, it should be strengthened before welding, and the component should be leveled after turning over, otherwise the component can not be corrected after welding. (3) the steel structure is arched, and the numerical value is larger than the design value. Members of the arch beam deflection installation numerical hour; arch numerical large, easy to produce extrusion surface elevation exceed the standard. 1) the size of the component does not meet the requirements of the design. 2) during the erection process, the correction is not made according to the discrepancy between the measured value and the calculated value. 3) the bridge with small span is small, and is neglected when assembling. 1) the permissible deviation of the steel structure is strictly tested in every step. 2) during the erection process, the rod and the assembly are completed, and the arch degree is measured after the construction of the joint of the site, and the other is adjusted in the construction. 3) in the small assembly process, the cumulative deviation should be strictly controlled, and measures should be taken to eliminate the influence of the welding shrinkage.